NEW CANAAN — Signs of every color and way too many names to remember decorated the parking entrances to New Canaan High and Saxe Middle School Tuesday morning, Primary Day. By the time unofficial results from the Secretary of State rolled in, Democratic voters in town, like most of the state, gave overwhelming support to Democratic candidate for Governor Ned Lamont. An overwhelming majority of New Canaan Democrats voted for Lamont, giving him 809 votes over Joe Ganim’s 53. On the Republican side, support was almost equal among candidates for Governor Bob Stefanowski and Steve Obstinik. The majority of New Canaan’s Republican votes for governor went to Obstinik and Stefanowski with 431 and 426 votes, respectively. At the state level, Stefanowski took 40,597 votes and Obstinik came last in a field of five Republican candidates. In total, 28.39 percent of eligible voters cast their ballots amounting to a total of 2,382 votes by the time polls closed at 8 p.m. 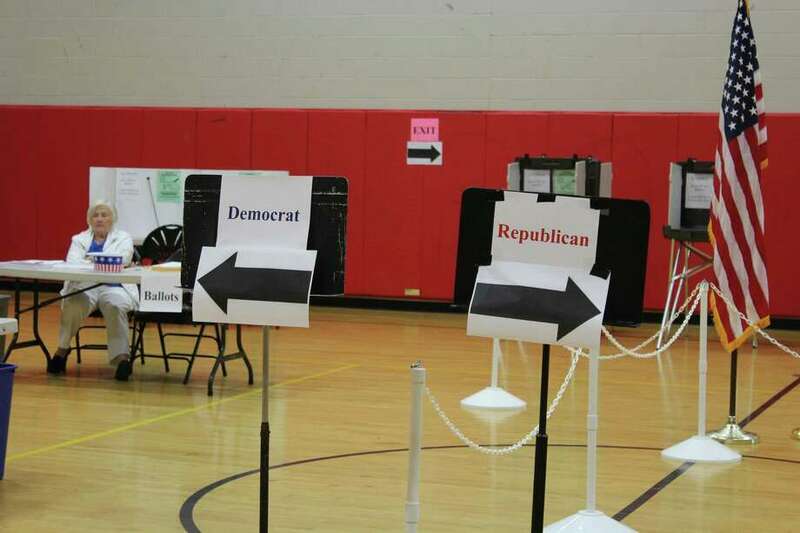 Turnout was slow throughout the day, peaking in the afternoon. *unofficial results from the Secretary of State as of Aug. 15 at 11:53 a.m.
Art Linares, a Republican candidate for treasurer, was standing outside New Canaan High School greeting voters as they pulled up to the school gym around 10:30 a.m.
Linares said he would be mostly in New Canaan for the day but that he would also venture to Danbury before the polls closed. Polls opened at 6 a.m. Tuesday morning with many workers coming in around 5:30 a.m. to set up. According to Voter Checklist, there were 239 absentee ballots. John Amarilios, one of the three registrar of voters in town, was at the District 1 polls Tuesday morning. Amarilios, who has worked at the polls for eight years, noted that the commuter crowd that usually casts their vote before the 9 a.m. train never came by, pointing to the low number of voters for the morning. Over at Saxe Middle School, District 1 and 2 registered voters headed over in low, trickling numbers throughout the day. Eloise Killeffer was also one of the poll workers who had been at the middle school gym since 5:30 a.m.
A collective of Republican, Democratic and even unaffiliated voters accompanying their spouses or family waded through the doors of the middle school gym. “I’m excited to vote, I always do whether it’s a primary or the general election,” Deborah Link said as she got in line. Numbers went up steadily from 6 a.m. to noon with a total 689 votes, or nearly 11 percent of the town’s eligible electorate, meaning registered party voters, casting their ballots. The highest number started coming in from 3 p.m. to 7 p.m. with an average of 212 votes casted each hour during that time frame.